The pretty blue house is in a very safe location with other holiday houses. The shared green area is ideal for children to play and there is a private small garden and patio also. Bedroom 1: Double bed with shower room ensuite. One house bathroom and one shower room. Pets are allowed on request, provided they are house-trained and do not cause any disturbance to neighbours. An additional cleaning fee of €35 applies, this is payable directly to the keyholder onsite. Please be sure to mention your pet on booking. Why not also stay at Kerry Coast House? Our sister self-catering house is a waterfront house on Kenmare Bay. Why not spend a week in County Cork and a week in County Kerry? 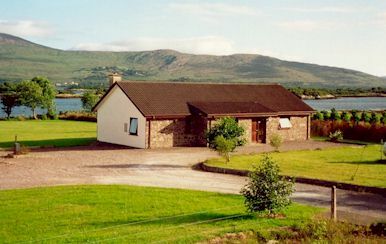 Read up about the house and the beautiful Ring of Kerry.